EED 8 is a Leyland Titan PD1 and according to others on the web it is said to have a Leyland/Alexander H56R body new in 1947 to Warrington as their number 24. Maybe Leyland were busy at the time and it was a Leyland body assembled by Alexander. It is at present owned by NWVRT and they have repainted it recently into Warrington colours. It was one of three half cabs in service during their 2014 rally at Kirkby. How close to a Leyland body is that? Alexanders built numerous bodies under sub-contract to Leyland – although the detailing on the Ribble Titans betrayed their non-Leyland credentials. I seem to remember reading that there was at least one other sub-contractor (Santus?) – and was SMT involved in this as well? SMT certainly built their own "Duple Vista" bodies on Bedford OBs which were virtually indistinguishable. Alexanders certainly built a "Leyland" body on a PD2 prototype. David, in a similar manner to the Alexander sub contract PD1s were also bodied by Samlesbury Engineering in Lancashire. Thanks, Chris. I think maybe that it was Samlesbury that I had in no. Warrington 24 (EED 8) has been in preservation for many years in Warrington colours, and has indeed been subject to a recent repaint. 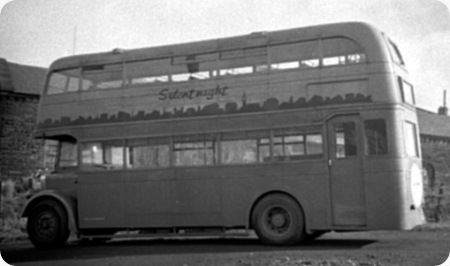 Although, as has been said, the body was indeed built by Alexander, it is still ‘officially’ a Leyland body, and has always been described as such, in the same fashion as East Lancs bodies built by Bruce and later Neepsend were initially described as East Lancs products, although latterly Bruce and Neepsend have been used to describe them, so Leyland or maybe Alexander, but please not Leyland/Alexander! …..and, of course, there is the long Alexander tradition of building other’s designs – sometimes under subcontract, sometimes not. (Glasgow’s "Weymann" bodies). This was replied to by the likes of East Lands and their R type clones! These Alexander-built bodies (the ones for Warrington at least) had a single window in their upper rear emergency exit – as opposed to Leyland’s more usual two – making the back end tend to resemble the prewar Leyland body. It is just discernible in this view. The other distinguishing feature was that normally they had four small sets of ventilation slots along the top of the cab door, unlike the standard Leyland product which had just two horizontal ones, one above the other. However the one pictured has the latter, so I presume must have acquired a secondhand door from a Leyland body at some point during its restoration. EED 8/9 is this correct? 3) had an electric gear selector, such as on early Atlanteans, Fleetlines, etc. If you fail to get a response to your own query here, can I suggest that you try the message board at the sct61 site, it’s always a good place to have questions answered. I think Walsall bought a couple of East Lancs bodied PD1s from Warrington , about the same time as the RTLs. The two Warrington Corporation Titans sold to Walsall Corporation were 100/01 (EED 9/10). 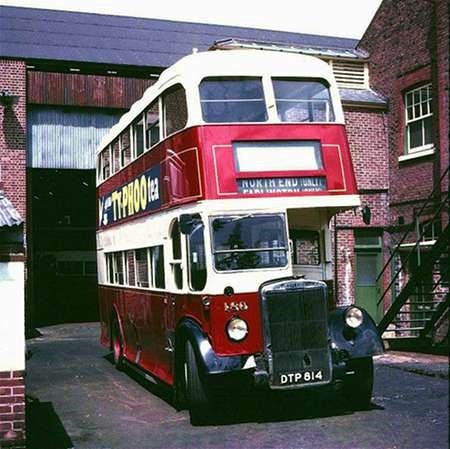 They were Titan PD1A with Bruce L27/26R new in 1947 and sold to Walsall in July 1959 as numbers 198/99, lasting until being sold for scrap in 1963 and 1964 respectively. They were Warrington Corporation’s only two lowbridge buses. I have been the owner of ex-Warrington PD1 EED 5 (fleet no.24) for nearly 40 years! Like EED 8, it has bodywork designed and produced by Leyland but assembled by Alexander – I have a copy of the letter from Warrington confirming this. 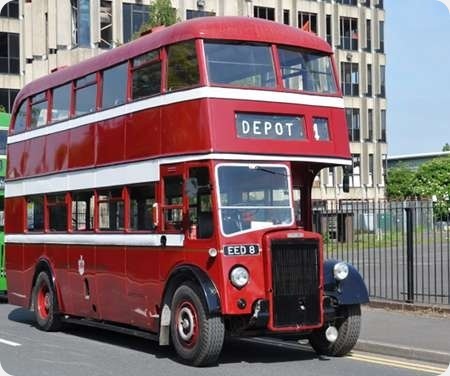 The body on EED 5 is original and classed as a Leyland metal framed type: this has a cab door with four vents near the top and rear emergency door on the top deck containing two windows. In distinguishing between the Leyland and Alexander product on the PD1 chassis I have always used the style of the front panel of the cab as the determining feature. On the Leyland body it always conceals the mudguard, usually with the horn inserted as on the Warrington bus. The Alexander version has a shorter and slightly more set back panel allowing the bottom of the mudguard to protrude, as can be seen in the attached picture. This actually shows both PD1 (right) and PD2/1 (left) versions of the ‘pure’ Alexander product. There are also variations in the shape of the nearside canopy. The Leyland style on the Warrington PD1 is a continuous curve from top front corner to where it meets the mudguard, projecting in front of the bulkhead. This is echoed on the Alexander PD2, but on the PD1 it goes straight back from the front corner with quite a short valance with a basically angled profile. There is no projection of the side panel in front of the bulkhead. A further question is whether Alexander actually produced a highbridge version of the Leyland clone (as opposed to assembling Leyland parts). There are certainly none that I can locate in any of the SBG fleets, although they might have delivered to other fleets. Nothing at this period was supplied to any of the Scottish municipal fleets. The photo of CRG and AWG also seems to show 2 other diagnostic differences. The gap between the 2 blind boxes and the design of the top of the upper deck front windows. The points you mention are diagnostic between the versions of the Alexander body; I was aiming to highlight the differences between the Leyland and Alexander products. I’ve seen EED 8 mentioned on here and just to let you know it’s back in Warrington and privately owned I’m trying to set up a page on Facebook for my husband it his is bus. I am sorry to inform you that EED 8, which was preserved in Warrington, was destroyed in a fire on Thursday 1st March 2018. A sad loss. Sad to say Warrington Corporation no 8 EED 8 is no more, destroyed in fire at Fairbrothers Bewsey Warrington. It was very sad to see the destruction of EED 8 by fire, a tragic accident that has destroyed all but the chassis, running gear, cab and the front, but it was remarkable to see the engine start and run straight away so that it could be driven out of the shed. I wish Ray and colleagues every good wish in their desire to rebuild the vehicle and hope that one day we can re-unite EED 8 with my bus EED 5. How sad, Phil. What actually happened? I saw the bus on BBC North West news and the vehicle was still recognisable but sadly I think the best thing for EED 8 is to be sold as spares for another Leyland PD1. The only other option, which would effectively mean building a new bus would be to follow the example of WW2 utility Guy Arab CDR 679, which lost its original body but was fitted with another utilitybody, but such matches are rare. I wish the owner well and I’m sorry about the fire. One of 19 identical PD1/1A’s delivered in 1948, 188 still looks very smart in its glossy maroon and white paint, with roof of grey, paint dipping at the corners à la London Transport’s post-war STL 18/20’s, which had identical bodies. It has just entered Guildhall Square, Portsmouth, having just come down Commercial Road and under Portsmouth & Southsea’s High Level Station bridge, seen to the left of the bus. Behind, and to the right, is Brickwood’s Sussex Hotel, with its brown-tiled façade. 188 has come from Portchester and is en-route to the Floating Bridge, Old Portsmouth, not, literally, a floating bridge, but a vehicle ferry over to Gosport. Note the police telephone box and the holidaymakers, dad with suitcase, on what looks a lovely Summer’s day, by the look of 188’s open windows. The trolley wires would be used for another few months. The photo was taken about 1962 and it’s nice to see one of these vehicles with a full blind display (perfectly set), since they were usually relegated to peak-hour working, with just a destination display, in this, the twilight of their lives. 188 was withdrawn in 1967, after 19 years service. The city coat of arms on the side is in a separate photo. 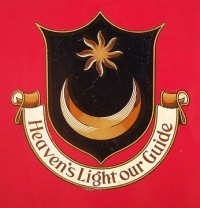 The motto’s in English; no fancy Latin for Pompey folk! To the right of the main photo, just out of view, was the Taj-Mahal Indian Restaurant. In 1967, a colleague and I were invited to another colleague’s retirement lunch. He’d served in the Indian Army in the war and suggested we’d like a Madras Curry. It was our first curry and was so hot as be virtually inedible, but we couldn’t upset the man; so ate it! I never touched another curry for 20 years! For our host, however, it was not quite hot enough! An early example of "Leyland Loonacy". Weymann’s classic post-war design marred by Leyland’s insistence on siting the Speedo unit in such a position and way that the windscreen had to be small and squared off. The logic was that the Leyland body had a far more attractive windscreen (it did) and therefore people wouldn’t buy bodies from anyone else (they did). Did they really believe their own argument in Lancashire? What an excellent picture and the highlighting of the City Coat of Arms. Perhaps others may be put on the site with the translation of the Latin inscription. Incidentally nowadays you never see suit cases being carried since the invention of the trolley case. The early post-war Weymann body was certainly a classic but it always looked at its best on the AEC Regent chassis where the radiator, cab windscreen, and in fact the whole package came together just right. I lived as a child in the Gosport area from 1949 to 1952, and well remember the Gosport – Portsmouth Point chain driven Floating Bridge, which opened in 1840 and finally closed in 1959. As so often with short term decisions based entirely upon capital renewal costs, the closure of this facility was misguided, and the result may be seen in the extreme traffic congestion that now plagues the Gosport peninsula. If this photo of No. 188 was taken in 1962, then the Floating Bridge was long gone by then. though the slipway at Portsmouth Point may still be seen today. The RT/RTL and RM were designed as a harmonious whole – and this is generally acknowledged – but there have also been unofficial collaborations. Weymann always worked closely with AEC which probably explains why that combination seemed to work. [For a time, from 1933 to 1947, Sheffield Transport only had AEC and Weymann in that combination – their many Leylands always having other coachwork.] There was the Guy/Park Royal tie up – begun before Park Royal were taken over by AEC/ACV. Two others which, in Philip’s words "came together just right…" were the Bristol Lodekka (in all forms) and the BMMO D9. It’s what I call balanced design. Bad and/or ugly design is not balanced, there is always at least one thing that "jarrs". 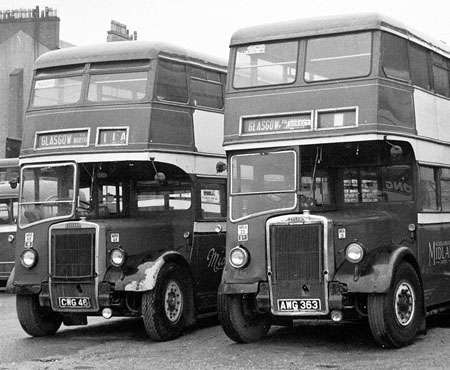 Looking at a picture of preserved Sheffield 904, I realise that all of their Roe/PD2s from 1957 and the PD3s had exactly the same windscreen as the final Leyland bodies (1951 – 1954). Strangely, the Weymann and ECW PD2s had a different, smaller, windscreen (with similar profile) which Chesterfield also had on its Weymann PD2s. The other collaboration which I forgot (above) was Leyland and Metro-Cammell (as opposed to Weymann). Roger Davies, in his Ribble book, is only one person to state that there was tacit agreement, after Leyland gave up building coachwork, for business to pass almost automatically to MCCW. 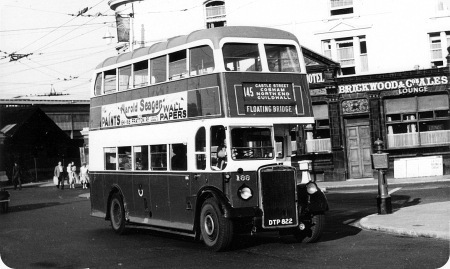 Tynemouth and Wakefield’s ‘Northern General’ had some AEC’s with this type of Weymann body, and Northern’s first 8ft wide buses were GUY Arab’s with a very similar body but with sliding cab door. When I started at Percy Main I did my training on one of them, the fleet number was 189 FT? ?89. It had a crash box, and you needed a block and tackle to steer it. One of them went to Chester Le Street depot where it became a full fronted dual control vehicle. FLOATING BRIDGE took quite a while to disappear from the bus blinds, and local speech, too. Undoubtedly, it was old and worn out, but it was a shame it wasn’t replaced with a larger version which would have carried more vehicles. It was a tourist attraction, too. It’s hard to believe that the A27 between Portsmouth and Southampton (Itchen) also had a floating bridge until supplanted by a bridge in 1977, even though bridge plans had existed since 1936! Thank you Ronnie for that magnificent description of the action necessary to deal with heavy steering – its tickled me and I’ll be chuckling all evening now !! Further to the comments above concerning Weymann bodies on chassis other than AEC, it is not difficult to find other post war exceptions to this tendency, but I never knew that Leyland deliberately tried to "dissuade" customers from purchasing non Leyland bodywork, as David so vividly points out! In the pre-war period, the Leyland/Weymann combination was perhaps more common, the Plymouth fleet coming to mind, as well as those handsome full front TD5s of Bournemouth. I also recall some comment in "Buses" in 1954, when Leyland had announced the end of bus body building, that MCW was the natural successor, a fact perhaps born out in the integral developments such as the Olympic/Olympian, and some of the lead up to the Atlantean. If anything, Park Royal would seem to have been more "in league" with AEC in the pre-war period, the balance shifting towards Weymann in the post war era. Classic Weymann bodies look magnificent on any chassis really, and my mind is so easily led to the pre-war Bradford fleet, where Weymann bodied Daimler COG 6s were a common sight. Of all the many coachbuilders which we remember, Weymann must rank as the all time "classic", as they kept their basic trade mark shape and profile from 1932, with the original Rackham inspired design, until the Aurora styles of the mid 1950s, which, for a time, ran concurrently with the newly introduced "Orion"
John. Source for the "squared off" Leyland comment is Doug Jack’s "Leyland Bus" and for AEC/Weymann cooperation "Weymann Story Part 1" (Senior, Townsin and Banks). This book also quotes a tendency, in the immediate pre-war period, for senior staff to move jobs freely between Addlestone and West London. Park Royal emerged from the ashes of Hall Lewis in 1931 but were only acquired by AEC/ACV in 1949. Weymann produced a one off, none to handsome, body for the prototype Regent which was exhibited at the Motor Show. This became Sheffield Transport 66. It was after this that the first version of the classic Weymann design emerged – the first of many for Sheffield, but only on AEC until 1953, after which Leylands were also bodied for STD. The Leyland /MCCW link was only really broken after Leyland "merged" with ACV in 1962 – after which Leyland/Park Royal-Roe was the preferred one stop choice. To add to the very knowledgeable comments made by John and David on the Weymann classical body of the thirties, forties and early fifties. a good livery such as Portsmouth Corporation was the "icing-on-the-cake" to show this body style at its best. Sadly Weymann lost the plot in the mid fifties when their Orion body appeared, and despite some good liveries applied by some operators, this body was never in the same league as the their earlier classical-style body. The Portsmouth Leyland PD1/1A Weymann was a gem, exuded quality and was very long lasting. In modern day language, it was a "value for money" bus. Just as a postscript to David,s comments on Leyland,s strategy to supply the all Leyland product, there is evidence to suggest that bodybuilding and chassis production were never of equal capacity, which is what surprised me about the undoubted truth which David has highlighted in this matter. Regarding the relationship between AEC, Weymann, and Park Royal before the post war mergers, I would be interested to learn whether this was any more than just a friendly association. I have been counting up the bodies on AEC demonstrators pre-war, and Park Royal seems to have a lead there, if that is anything to go by. All very "interesting stuff", and, as Richard says, what magnificent vehicles (Weymanns) were, especially when adorned by a livery as attractive as that of PCT. More to the point, why did Leyland not have confidence in what was universally regarded as one of the best bodies around (style AND quality). The Weymann book and the Hall Lewis/Park Royal web-site show the fascinating and labyrinthine connections between each other and AEC – let alone the ECW, Roe and Roberts connections (nearly forty years before British Leyland). Maybe the alliances and associations were purely pragmatic. Imagine Blankchester Corporation saying EITHER (1) "we want 30 standard 56-seat deckers, and the all-important criterion is that they are delivered by 30 June next year." OR (2) "we want 30 PD2s (or Regent IIIs or whatever). We are not in a great hurry but we insist on the bodies being provided by XYZ in order to support local industry." Sensible manufacturers reply (1) "We can do it, provided you are happy to accept bodies from JKL or QRS, who are the only manufacturers who can supply bodies within your timescale." or (2) "We are happy to fit XYZ bodies in order to secure your business." The daft ones say "It is our corporate policy only to associate with our own chosen partners, so we can’t meet your delivery schedule/we are not prepared to fit XYZ bodies – and you can like it or lump it!" Sooner or later they go (or went!) out of business. …..but Stephen. That sounds just like the barmy idea of current coachbuilders (especially COACH builders) hitching their waggons to just one chassis – thus depriving twice as many people of their preferred vehicles. Adopting a ‘take it or leave it’ policy Eg the Leyland National, and giving the customer little or no choice in the matter proved to be the eventual downfall of the British commercial vehicle industry. For example, did you know that when AEC became part of British Leyland, they had a design on the drawing board for a totally new lorry but it was rejected because the new Ergomatic cab was being introduced more or less across the board, and Leyland wanted to standardise production, so the design was sold to SAAB, it became the SCANIA 80 and 100, and later the 111, the rest as they say is history. You’re absolutely correct, Ronnie. British Leyland, as distinct from Leyland Motors, went a long way to destroy local industry – helped by the National Bus Company and then, ironically, by Baroness Thatcher when she broke up NBC with privatisation and deregulation. There was a LOT of good in the Leyland Leopard but the AEC Reliance, particularly AH691/760s, was vastly superior. The AN68 Atlantean was an excellent bus but the consensus is that it would have had a run for its money had the FRM gone into production. Then, of course, both Scania and DAF had licences to build the 0.600/0.680 engines – but ended up doing it so much better. DAF/PACCAR’s MX engine, originally based on the Leyland, is a world beater. There are even more examples in the private car sector. I, too, have often thought that the FRM could well have dominated the rear-engined bus scene, had it gone into production. Dearer though it might have been, the fact that it was only a slightly modified RM, with a reliable pedigree, gave it the chance to sweep the board. Sadly, there were vested interests at work. Yet another might-have-been! Lovely to see this view of No 188 passing through the Guildhall Square, also the Cravens bodied trolleybus in another contribution here. I suggest that the picture date is a bit before 1962, nearer 1959/60. The bus still has a grey roof, and does not have flashing trafficators as far as I can see. The Corporation gave the motorbus fleet white roofs on repaint from late 1959/early 1960, and the exercise was completed by 1963 (apart from the odd older vehicle due for withdrawal, like vee-fronted Leyland TD4 No 129 (ex-127), withdrawn with grey roof in 1964). All the trolleybuses remained grey roofed until the end in July 1963. The simple lining out on the red paintwork, and the chromed radiator make the vehicle a proud sight. Some of the batch had painted radiators. When I was a young enthusiast, and read Buses Illustrated, there were several letters and contributions c.1958-60 about PD1 versus PD2 engines and performance – the PD1 always came off worst! In the early 1980’s (c.1985?) one member of the batch survived in a corner of a field with some other ex-CPPTD stock at Waltham Chase, on the Wickham / Bishops Waltham road B2177. I have no idea whether any of these survived or who was keeping them. I was brought up in Portsmouth in the 60s and have clear recollections of this batch regularly taking us to the football grounds off of Eastern Road from Northern Grammar school for PE lessons. I remember seeing many of them delicensed in the side shed at Gladys Avenue Depot. interestingly one of the batch became a trainer bus at North End and was nicknamed Gladys! The bus referred to at Waltham Chase happily survives under the care of CPPTD. I used to get the 145 bus each day from North End to Old Portsmouth. Cost 3d (three pence) from 1961 to 1971. The destination was Floating Bridge, although I never knew what that was, changed to "Point, Old Portsmouth". Some buses in the early sixties also had letters. The A and B route along Commercial Rd for example, then became 1 and 2. Same route, different directions! Late night buses, "North End only", would go to the Gladys Ave depot. Also Fratton Park specials from North End to "Football Ground". I’ve just come across a wonderful colour photo of a sister vehicle to 188, taken at North End Depot in 1966, on the cusp of being withdrawn the same year. It says so much of Portsmouth Corporation’s high standards that it could turn out a vehicle almost 20 years old, almost as good as new to look at. Note the white roof, which the corporation restored after WWII, in the early ’60’s. The steam powered vehicle transporting floating bridge ran between Gosport Ferry and Portsmouth Point, where the old landing stage can still be seen. Like the still running Sandbanks ferry in Dorset, it functioned by winding itself across by engaging chains laid on the floor of the harbour. It began operating in 1840 and received a new vessel, the Alexandra, in 1864, and she lingered on, spasmodically in the last years, until 1959. I lived near Gosport during the years 1949 to 1952, and remember it well, though I never actually travelled on it. Nowadays the Gosport peninsula is a traffic nightmare, and a vehicle crossing facility would surely be useful.